MG6 has just got even better with the introduction of the new MG6, which offers 'more MG for your money'. amazing value with prices now starting from as low as £13,995. The 2015 version of the MG6 offers major advances in every area of the car which first launched four years ago. 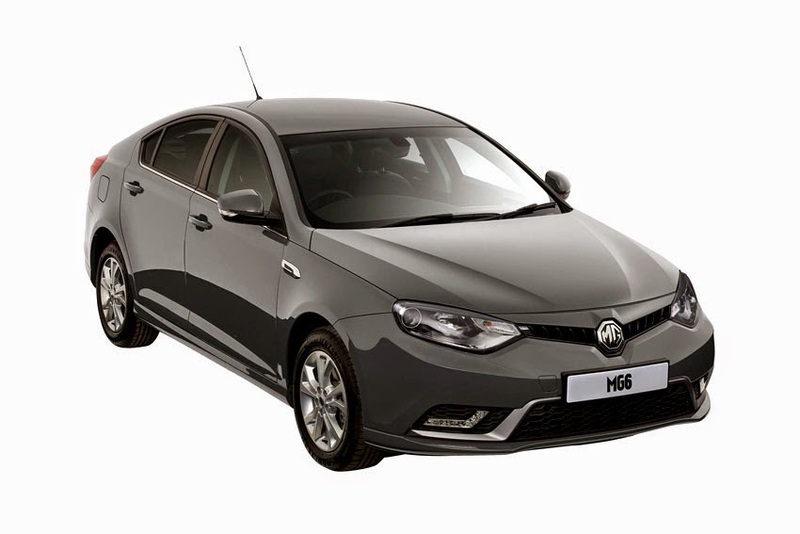 The new MG6 offers improved performance; a striking new design; higher levels of comfort; enhanced levels of standard specification; and key technical advances. The new model offers higher levels of performance, lower emissions, and improved mpg and results from the intensive development work carried out by engineers based at MG's Birmingham operation. The 2015 DTi-Tech engine is the latest generation of MG's own developed diesel engine. This version still develops 150 ps and a strong 350 NM from only 1,800 rpm, but now produces only 119 g/km of CO2 and gives 4.6 L/100 km (61.4 mpg) in combined driving. Improvements have also been made in drive ability making the new MG6 the best balance of driver satisfaction and efficiency yet produced by MG. In short, the engine on the new MG6 has been significantly improved and the 10 g reduction in emissions makes the car 'cleaner' but with no loss of performance. The new MG6 is, on average, 75 kg lighter than the out-going car and is 0.5 seconds quicker from 0-60 mph. Now it takes 8.4 seconds compared to 8.9 seconds in the previous model. Striking new designs to the body, particularly the front and rear profile, give the car a new look, while distinctive daytime LED running lights means that the new MG6 stands out from the crowd. Inside the new and improved model, it looks and feels refreshed. Almost every area of the interior has been enhanced to give even higher levels of comfort and convenience. The new instrument cluster is now clearer; redesigned with a modern tunnel-style analogue presentation. An Electronic Handbrake (EPB) has given the designers more scope to refresh the layout between the driver and front passenger seats. The electronic parking brake is incredibly easy to use; it activates manually and automatically releases when you want to move off. New S models re-write the definition of an entry model – because they are fitted with heated front seats as standard. LED daylight running lights, 16-inch alloy wheels and the electronic parking brake are all part of the package and at no extra cost. The interior upgrades, including the addition of bright new silver highlights, give an enhanced feeling of quality and consistency. Meanwhile, the stylish new seat materials give a refreshing new look and style. Also standard on S models and upwards is an all-new electronic differential, called E-Diff, which works in conjunction with a sophisticated stability control system. This ensures that wheel spin in cornering is kept under control, giving the driver both increased safety and a more involved feel. The mid-level TS has the following as standard in addition to the S model; part man-made leather seats; rear parking sensors; automatic lights; windscreen wipers; cruise control; auto dimming mirrors and more. But it’s the introduction of the all-new MG touch infotainment system, which debuts on the TS, that puts the car way ahead of all of its competitors. Move up to the top-level TL, still at only £17,995.00, and the levels of enhanced comfort just get higher. Luxurious leather seats and powerful HID (high-intensity discharge) lamps are just the start. The 35W Bi-Xenon HID main lamps alone offer a much better illumination of the road ahead and are a major advance on standard halogen bulb or projector-type systems. 'Bending lights, which are integrated into the HID units, have a speed sensitive cornering function which follow the turn of the front wheels giving the driver a clear view of potential hazards when cornering in the dark. It operates from speeds up to 40km/h when reflectors cleverly focus the light source to follow the road as the car turns. This improves both safety and driver well-being by taking much of the stress out of night-time driving. A rear camera, now equipped with guidelines, dual zone climate control and electric seats are all standard on the top-of-the range MG6 TL, which is distinguished by a new chrome grille. The level of detailing that has been lavished on the new MG6 has created a new-look sporting profile, yet the car retains all of its huge practicality and functionality. "The substantial advances we have introduced on the new MG6 make the car even better value-for-money on their own, but couple this with the reduced prices we have announced and it really is an outstanding package," said Matthew Cheyne, Head of Marketing, MG.
"There are so many great things about the new MG6 that it's impossible to highlight one because so many advances have been made. Probably the best way to sum the new model up is that it simply offers much more car for your money." "Value-for-money is what customers are looking for now, and we have certainly delivered that with the 2015 MG6."